All events in place Barbat ! Surface : 75 m2 (1. floor). Surface : 72 m2 (Ground floor). Characteristics: Very close to the beach, with a view to the sea, with terrace, with garden. Environment: Ability to use barbecue, common garden, Parking by the house. On the hill of St. Damian in Barbat, can still be seen the ruins of which are centuries capturing the imagination of local residents and curious explorers. These parts are the remains of one of a number of systems from the early Byzantine fortifications Justijanove reconquest of this part of the Adriatic coast in the first half of June. century. The central building inside the fort is certainly the church, a single nave with a broad semicircular apse at the east end.The original form of the church can be reconstructed only in the layout, because the north and south wall of the partially and fully commissioned facade. Analyzing all the characteristics described remains and taking into account their distinctive accommodation, without any doubt, we can say that this bell fort one in a series of magnificent fortifications to control the borders of the Byzantine Empire from the time of re-conquest of the eastern Adriatic coast, ga took Justijanov generals Belisarius. In Barbat is a sarcophagus which is the parish church bell and was found in the 5th c. In the middle of the sides is carved a cross in a circle. Krovasti cover the dehiscent. The church is worth a crucifix. Crucified Jesus is shown with his hands placed flat. On top of the Cross Holy Spirit, on the right arm of the Virgin Mary, St. John on the left and cross at the bottom of Adam`s skull. Crucifixion dates from the 6th century and one of the 10 oldest crucifix in Croatia. The slopes of Kamenjak, the Mount St. Damian in Barbat, can still be seen the imposing ruins of the centuries capturing the imagination of local residents and curious explorers. Until now, experts and researchers differently and incorrectly determined mainly by the dating of the remains of this historic assembly, and they were reported as early medieval, pre-Romanesque or mature medieval, Romanesque or Gothic.Only in recent times have come to the realization that these are the remains of one of the series of the early Byzantine fortifications Justijanove reconquest of this part of the Adriatic coast in the first half of June. century. The central building inside the fort is certainly the church, a single nave with a broad semicircular apse at the east end.The original form of the church can be reconstructed only in the layout, because the north and south wall of the partially and fully commissioned facade. Analyzing all the characteristics described remains and taking into account their distinctive accommodation, without any doubt, we can say that this bell fort one in a series of magnificent fortifications to control the borders of the Byzantine Empire from the time of re-conquest of the eastern Adriatic coast, ga took Justijanov generals Belisarius. 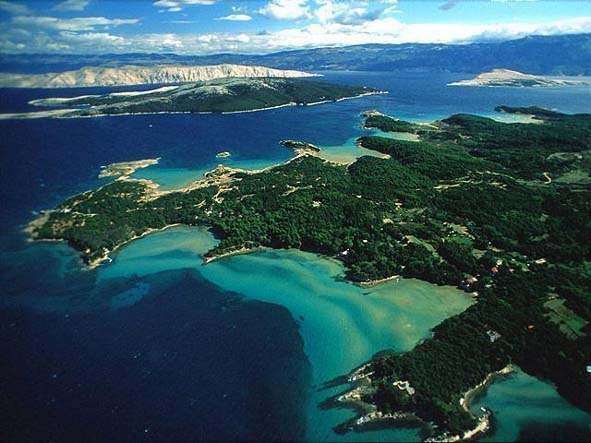 Iskrcavajući from the ferry, the first place that awaits us is Barbat, known for sandy beaches.